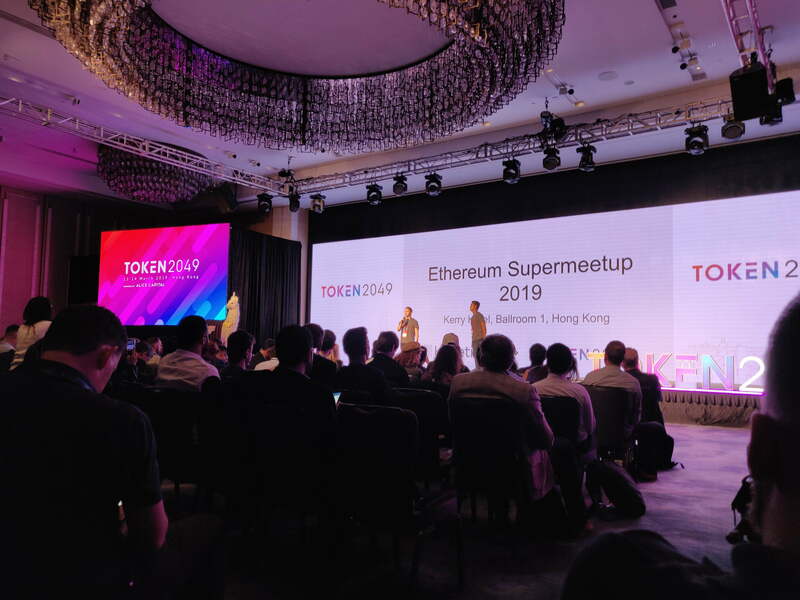 Somehow, some way, a group of crypto crusaders managed to convinced Vitalik Buterin to grace the world’s first Ethereum Supermeetup, hosted at Token2049, with his presence. Justin Sun, the founder of rival blockchain Tron, may have been standing in the back of his room with a smirk on his face and a man-turned-avocado, but the Ethereum founder took to the stage anyway. What followed was twenty minutes of an unadulterated topical overview of his brainchild’s latest happenings. The crowd of 1,500-strong was more than pleased, that’s for sure. Phones in the air, the crowd hollered as the twenty-something Vitalik Buterin sauntered onto the stage of Asia’s premier crypto event. Meek but recognizable, the Russian-Canadian long-time crypto jock uttered a drawn-out “heyyy”, eliciting a mere whoop or two from the crowd of 1000 or so. While the start of his presentation had some outright confused, everyone was enthralled with what came next. For those who missed the memo, since Ethereum launched in mid-2015, its core developers have had lofty ambitions. Buterin and co.’s plans have changed over the years, but alternative consensus mechanisms like Proof of Stake (PoS) and scaling solutions, such as the fabled Plasma and sharding protocols, have long been floated. The developers’ goal is to integrate all these improvements in an upgrade known as 2.0 (Serenity). But, the blockchain’s path to activate staking over its incumbent mining solution, a move claimed to reduce Ethereum’s energy requirements, improve decentralization, and bolster transactional throughput, hasn’t been entirely clear. The hope was that by Q3 or Q4 of 2018 — yes, last year — PoS would have seen some semblance of integration on the main chain. As the cryptocurrency community now knows, this hasn’t come to fruition. In fact, the project’s timeline has seemingly been pushed by upwards of six months to a year. On stage, however, Buterin kept his head high. He first explained that Serenity could simply be explained as “a way to bring technical improvements, like PoS and sharding, together to improve the Virtual Machine, Merkle Trees, the efficiency of the protocol, and a whole bunch of small technical things that you have never heard of.” Per the industry insider, this is all being done in a bid to create a “next-generation blockchain” to be hundreds of times faster and scalable than Ethereum’s current iteration. As it stands, Ethereum has yet to even enter phase zero (there’s a total of three phases — zero, one, and two) of the Serenity integration, but Buterin explains that this is coming. He remarks that phase zero is near-finalization spec-wise, touching on an effectively complete section of a whitepaper that outlines 2.0. Buterin explains that phase zero-related testnets, which are centered primarily around staking, could get launched by developments firms, which he calls “implementers,” like Parity and others, in the near future. In terms of sharding, meant to arrive in phase one and phase two, Buterin explains that developers have begun “early-stage implementations of that,” with there being some staking protocols becoming “standardized” in the testing ecosystem. He goes on to draw attention to Ethereum 1.x, which can be described as an intermediate series of protocols between 1.0 (current state) and Serenity. 1.x, as Buterin states, is focused on providing short-term scaling solutions through the implementation of prototypes of Serenity’s improvements and by bolstering the Virtual Machine as is. This should help to bring 1.0 and 2.0 closer over time, eventually giving Ethereum’s core team an easy way to easily segue into full-on staking, sharding, and the like. In an interview following Buterin’s keynote, Tron’s Sun and a silent avocado explained to NewsBTC that he doesn’t expect for Ethereum to be ready for Proof of Stake, citing the “constant” conflicts between miners, developers, and other stakeholders. But, everyone in the auditorium had smiles from ear to ear. If there were quarrels about the future of the project, they sure weren’t apparent. Decentralized applications (DApp), like finance-focused MakerDAO, have seen monumental adoption over recent weeks. Maker has seen its Ether pool and active user count swell by hefty percentage points over recent weeks. But, arguably more important is the recent mainstream adoption of Ether. Buterin draws attention to Brave, a browser with its own ERC-20 token (BAT), that is looking to give publishers, advertisers, and content consumers a better way to interact on the web through blockchains, specifically Ethereum. The platform has recently seen BAT added to Coinbase, as Brave partners with Cheddar, CoinDesk, among other big-name publishers to bring cryptocurrency even closer to the mainstream. In even bigger news, technology powerhouse Samsung has unveiled its first consumer-facing product, an Ethereum DApp browser that likely gives users of the Galaxy S10 lineup their first exposure to the cryptocurrency world.